The exposition about the memory of water, initiated and composed by Prof. Dr.-Ing. 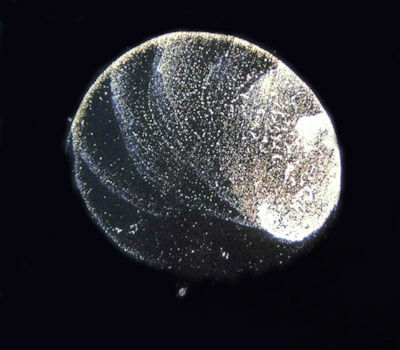 Bernd Helmut Kroeplin gives a new approach to the element water and includes the latest scientific findings and an artistic processing of the subject. The exhibition had its debut as an externally led project at the EXPO 2000 in Hannover at the water path. The content of the exhibition and the research is constantly complemented with new findings as well as photographic illustrations from several researcher of the team from Prof. Dr. Bernd Kröplin in Stuttgart and from all over the world. Lectures, international exhibitions and research papers, as well as books bring Kröplins new ideas of the water memory into the world. From the source of the water to the ocean - the water “is aware” of the respective itinerary it takes. 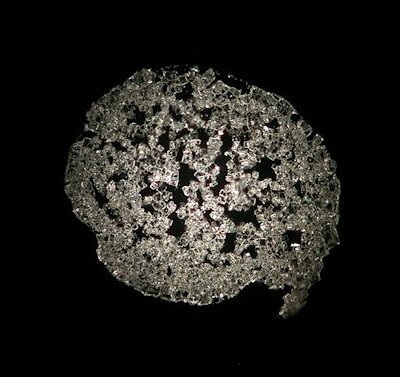 The microscopic pictures of the latest scientific research on the matter show the information that can be absorbed by the memory of the water. Pictures have been taken by the supervision of Prof. Kroeplin and his team. Radiation and waves have their impact on water – as much as even the sap of herbage stalks (parsley, olibanum, lovage) is apt to react in a sensitive way when under the influence of ultra sound, micro waves and x-rays to give but some examples. 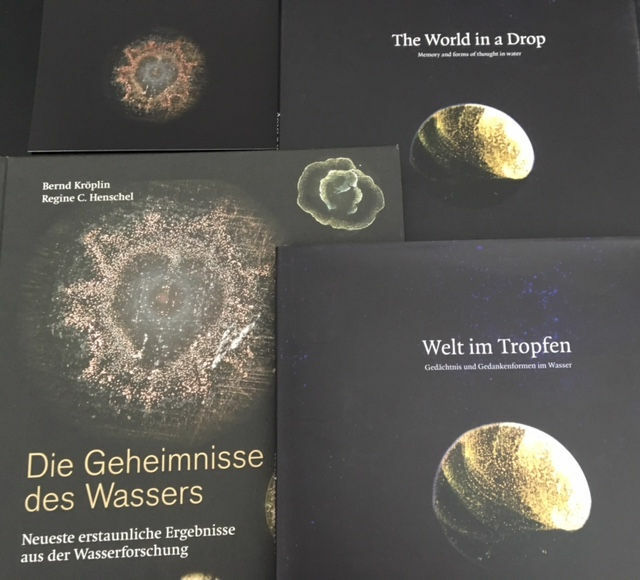 The pictures of the various drops have been taken by Joachim Schöck, Marianne Eberl and Bodo Leuthner. The pictures (above: 1, 2, 3) have been taken from the new book "Die Geheimnisse des Wassers", which comes out in autumn 2016. Tableau (left: 4) is part of the research paper "Electromagnetic pollution - A method for the detection of electromagnetic fields in living organism (englische issue)"
The human body is up to 70% water, we and our body react on electromagnetic impacts and vibrations - this is shown by the water droplet photos of M. Hein, J. Schöck, S. Staib and others. 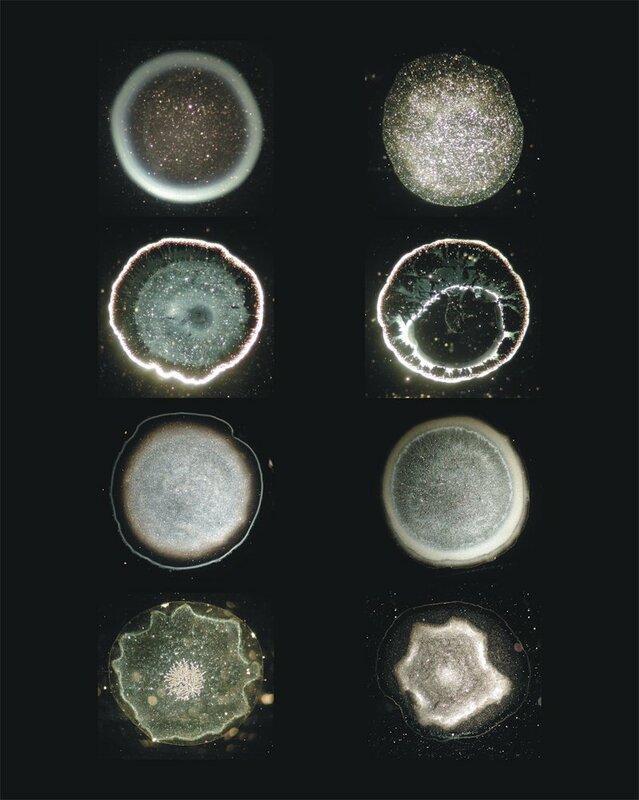 Interesting and amazing are the impacts of music and ultra sound, which we can detect under the darkfield microscope in a modification of the structures in the water droplets. An absolutely new field of our research is the documentation of the impacts of water desalination and water optimization facilities, and about the sensible impact of the experimentator onto the research. 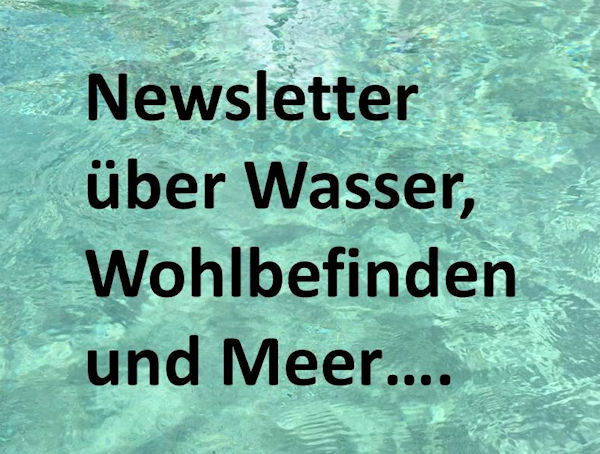 More informations you can find on this website under research or in the BOMRIM paper about "memory and communication of water" by Prof. Dr. Bernd Kröplin. The exhibits of Inge Just-Nastansky show the change in the water structure by adding into the water stones, plants, various salts, precious stones and metals. 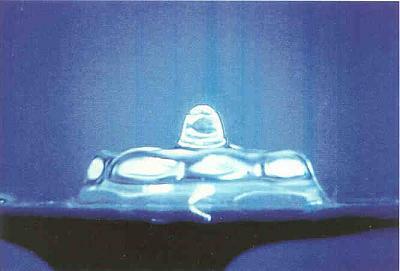 Also light, sun rays or sound may change the picture of the structure of respective drops. Bach’s oratory, rock music or the sound of a harp: Sound and music will leave extraordinary and most impressive designs on the water surface. Alexander Lauterwasser has photographed some of them. 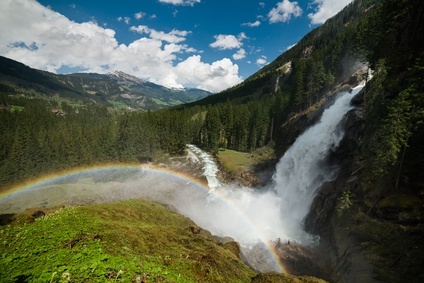 The artist Ruth Kübler invites you to a fantasy trip while exposing her pictures of various drops. Meanwhile we were able to show our exhibition “World in a drop – Water has a memory” to many interested visitors. 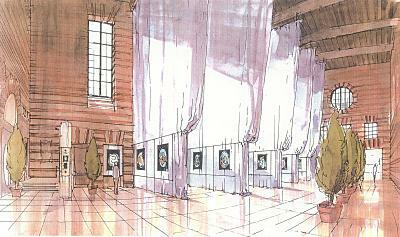 Please come virtually to some of our exhibition places or become inspired by impressions of vernissages and lectures. Actual dates you will find here. Our "World in a drop" explains the "Memory of water" with 15 exhibits. The exhibition "The fascination of water" is an exhibition for all senses. Therefor the exhibition has over 100 various stations to feel, to see, to hear and to discover water. This is so amazing and exciting, that the curators of the Field of Experiences for all the Senses chooses the theme "water" again. »Amazement, discovery, experimentation and experiences« is the motto in Nuremberg 2016. For more informations please look here. "The title of this exhibition announces a voyage through time, a seemingly chronological history of major transformations of time and space. This history seems to be linear, but it is so only in appearance. The title names the evidence that time and space mutate as consciousness mutates. The sailors who sailed with Christopher Columbus were afraid of the abyss at the edge of the earth and of the monstrous creatures they expected to find there. Taking our departure in this image, we may consider that for at least 1500 years a prior to this voyage, experiments, such as those conducted by Eratosthenes in 200 BC, had successfully proved the roundness of the earth. But nevertheless, to Columbus` men the world was still flat. Our world today is made up of three dimensions, which places us firmly on a globe. This is the state of mind of our contemporary civilization, even if higher dimensions are comprehended in mathematics and physics; and even if the collapse of space-time - as we understand it - has found a scientific expression in the field of quantum mechanics. 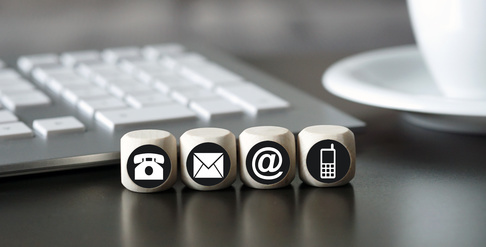 How does an idea take shape over time? How does the emergence of a technology - a means of transport, a means of navigation, a means of recording, for example - durably modify our consciousness and our relationship to space and time? The exhibition presents a group of contemporary artists whose works open perspectives on these fundamental problems. 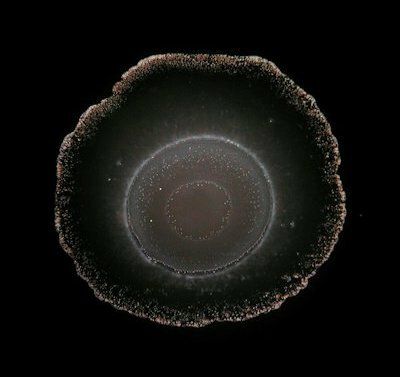 The passage from a flat to a round world, and beyond, is marked by shifts in consciousness. This is the thread of the exhibition - which is laid out as a journey - where instruments of man take a major role." 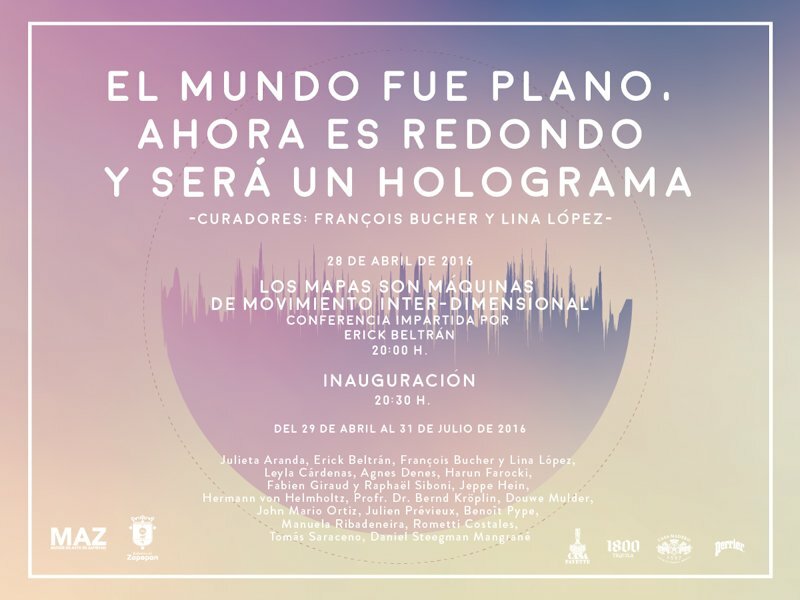 With exhibits from: Julieta Aranda, Eick Beltrán, Francois Bucher and Lina López, Leyla Cárdenas, Agnes Denes, Harun Farocki, Fabien Giraud and Raphael Siboni, Jeppe Hein, Hermann von Hemholtz, Prof. Dr. Bernd Kröplin (water droplets), Douwe Mulder, John Mario Ortiz, Julien Prévieux, Benoit Pype, Manuela Ribadeneira, Rometti Costales, Tomás Saraceno, Daniel Steegman Mangrané. Open from 28.4. to 31.7.2016. The world was flat, now it's round, and it will be a hologram. The exhibition The World was Flat shows contemporary art that engages with ideas about time and space. The World was Flat presents works by Julieta Aranda, Erick Beltrán, François Bucher, Rometti Costales, Harun Farocki, Jeppe Hein, Klara Hobza, Bernd Kröplin (with images of water droplets), Lina Maria López, Douwe Mulder, John Mario Ortiz, Julien Prévieux, Benoit Pype, Manuela Ribadeneira, Tomás Saraceno and Daniel Steegmann Mangrané. 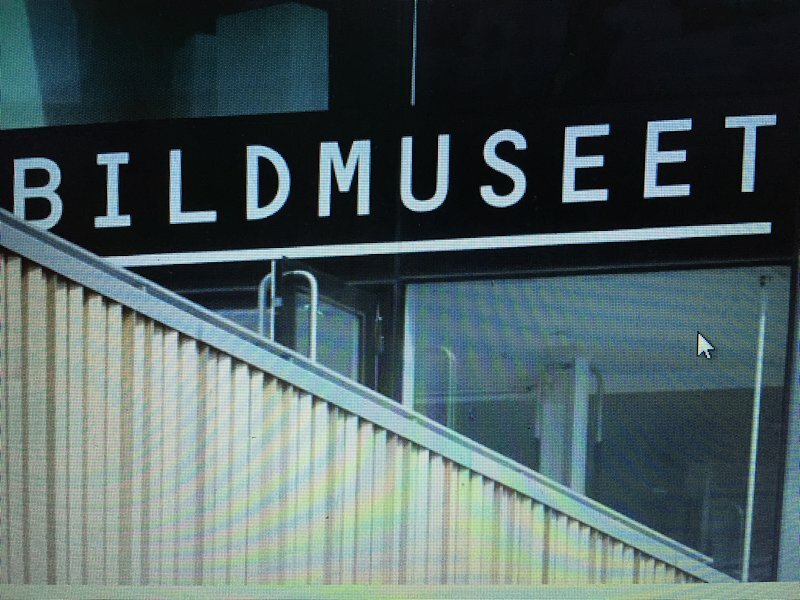 The exhibition was produced by Bildmuseet and curated by François Bucher and Lina Maria López. More information: http://www.bildmuseet.umu.se/en/exhibition/the-world-was-flat/19129. 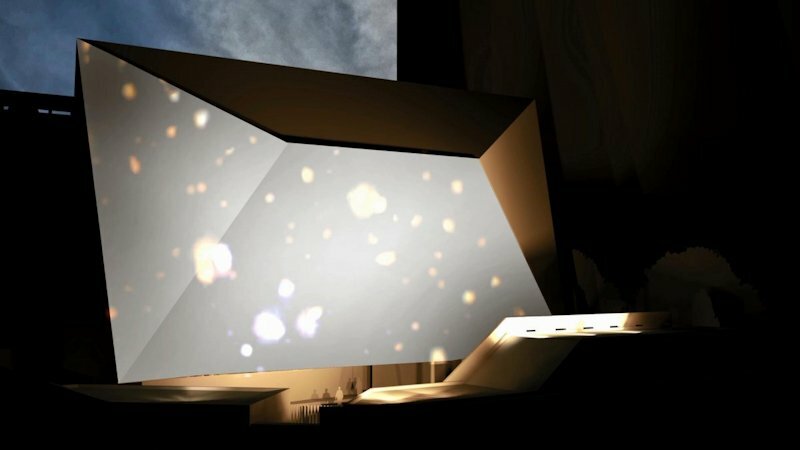 French light designer Matteo Messervy designed an artwork, which could spread the world about the environmental concerns and the challenges related to global warming. He combines the architectural qualities of the main building of the French Embassy to Thailand with his monumental visions. In his artwork he displays different natural settings in motion (also water images from our exhibition "World in a drop"), portraying the great variety of our planet's ecosystems and their peculiar dynamics. This artwork has been revealed at the occasion of the project Galleries' Night, organized by the French Embassy to Thailand, and was shown until the end of the Conférence de Paris, on December 11th (informations and photo were taken from the website: http://www.artcop21.com/events/6292/). A selection of our exhibits of the "World in a drop" participated at the exhibition "water affects" in the castle Kaprun; a lot of visitors from all over the world have visited this exhibition. "The ambition for our exhibition is to give our visitors a deeper feeling for our life and about our responsibility for our own health - and for a sustainable handling with the resource water and our earth and environment", said Markus Hatzl, initiator of the exhibition and head of organisation. The castle of Kaprun had been choosen for the exhibtion because of it´s nearness to the Kitzsteinhorn glacier (it´s in the sight distance of the castle Kaprun) and the famous Krimmler waterfalls. "Wasser, moves" - until 2.11.2014 a selection of the exhibition "World in a drop" together with the "Wasserklangbilder" from Alexander Lauterwasser was shown. About the topic of the exposition a lecture was held by Prof. Dr. Bernd Kröplin at the 28.9.2014 in Gengenbach. Alexander Lauterwasser held a water concert. For more informations about the vernissage please click here. The poster is one of the oldest and until today an actual advertising media for cine films. Some of the posters got cult status. 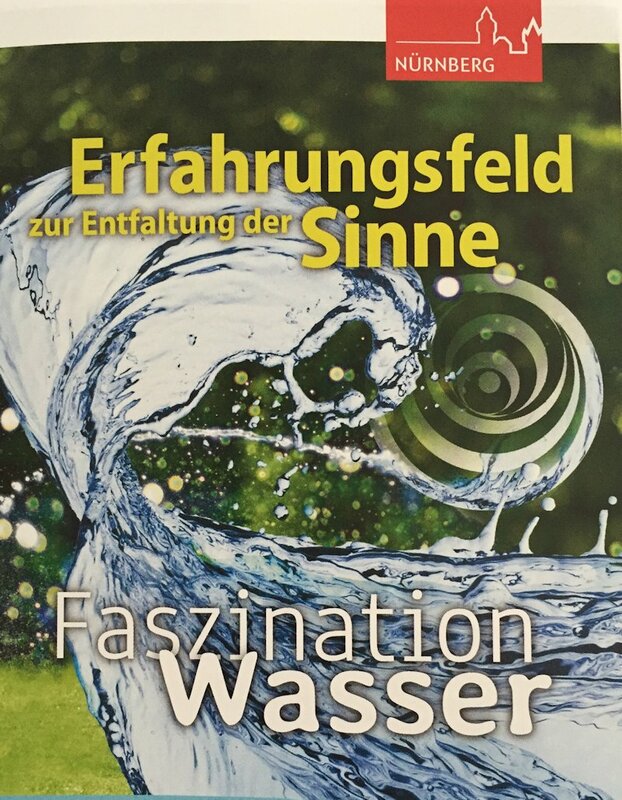 The exhibition "World in a drop" and a lecture of Prof. Dr. Bernd Kröplin (with movies about the special theme water) had been guests at the NaturVison filmfestival in Ludwigsburg. 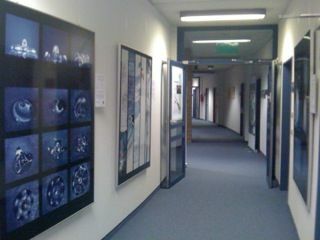 Especially for the cine world selected research pictures had been produced in poster size and presented in the typical cine show cases during the filmfestival. This had been a special selection of the pictures of the exhibition - other items had been displayed in the museum in Löwenberg in Gengenbach until 1.11.2014. During the second water symposium in Bad Füssing our exhibition "World in a drop" was shown at the 10th of september in the "große Kursaal". 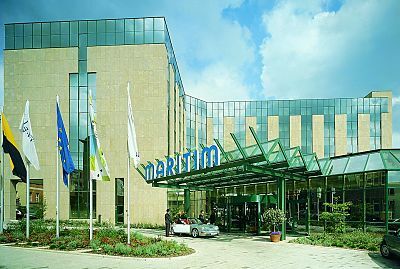 Until end of october 2012 it had been shown in the Bio Vitalhotel Falkenhof. 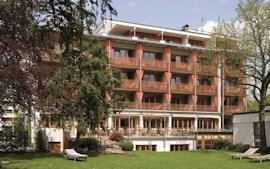 The bio hotel has an own thermal source and a new spa, in which water treatments for relaxing are offered. An ideal place for the exhibition about informations and the memory of water. The „Schwarzwaldsaal“ and the aisles of the 7. Floor of the Environmental Protection Agency have gained a new face: the 1,20m x 1,60m photos of the water drops of the exhibition altered the office into a gallery. The work of the exhibition team was rewarded. “The Environmental Protection Agency” counted a record attendance. More than double as much visitors as previously expected attended the Open House presentation on July 14, 2012. A selection of 20 photos from the original exhibition “World in a Drop” was shown. A supplemented version has been exhibited on September 10, 2012 in the “Großen Kursaal” in Bad Füssing. For the course of an entire year Kaufbeuren focuses completely on water. “The biggest water festival in Europe” offers discourses, lectures, educational trips, concerts, workshops, days of information, and actions in schools in all subjects concerning the life-giving elixir of water. 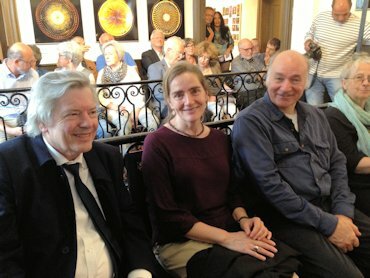 In the “Year of Water 2010” the renowned artist Katja Ebstein emphasized her commitment to give access to clean drinking water to all people on earth. The keynote address on the opening on March 25, 2010 was given by Prof. Dr. Bernd-Helmut Kröplin on the subject “The Memory of Water”. 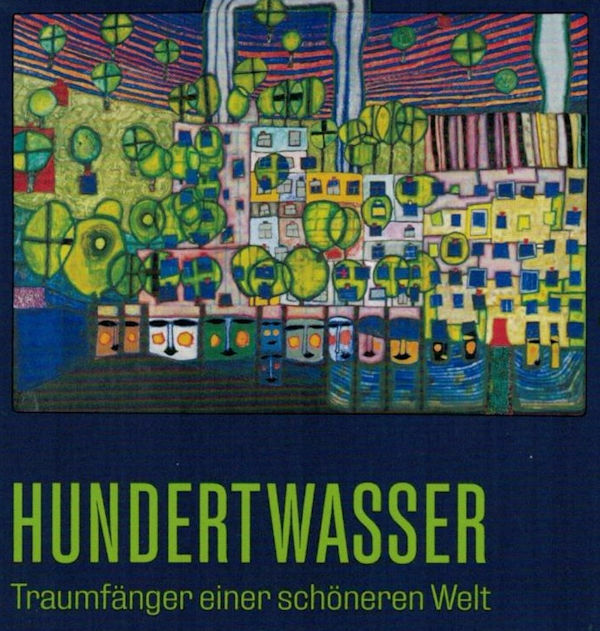 We are delighted to support the “Year of water 2010” in Kaufbeuren! The ninth exhibition April 3 – 7, 2006 was shown in connection with the international fair “Water in Berlin 2006” at the exhibition center at the Funkturm in Berlin. The eight exhibition May 25 – 29, 2005 was host at the “30. Day of Church in Hanover”. The exhibition hall “Globalisation” invited by “Bread for the world” showed eleven selected large sized exponats titled “Water as victual” (or everyday necessity water). The seventh exhibition March 17 – 20, 2005 was included in the fair “Wellviva” in Stuttgart. Tranquility is the source of strength – but how could you find your inner calmness, how could you gain strength for business, family, deadlines, and in the hectic of daily routine. What you could do for your health and how you could balance your body and soul – this you could learn at the fair “Wellviva”, the fair on wellness in Stuttgart. The special exhibition „Vital Water“ focused on the healing and “doing good” effect of water. Associated with this special exhibition in hall 4 we presented selected exponats of the exhibition “World in a Drop” for the first time. The sixth exhibition „World in a Drop“ took place October 1 – December 30, 2004 within the artistically supported program of the exhibition “Renewable Energy for Sustainable Development and Climate Protection“ in India. Besides research projects to subjects as photovoltaic, agriculture, wind energy and biomass water is a central issue for the Indian subcontinent. Not only in the sense of a developing project: clarification and purification of sewage into drinking water is one aspect of the exhibition – transmission of information and the memory of water within the art-forum will be the other. In India, there was shown a selection of the photographs from the successful exhibition “World in a Drop” as well as some new samples, see attached photos. The exhibition was organized by, among others, the Society for the Promotion of Development Oriented Projects (VEV), Stuttgart in collaboration with the Institute for Static and Dynamics for Aerospace Constructions (ISD) in Stuttgart. 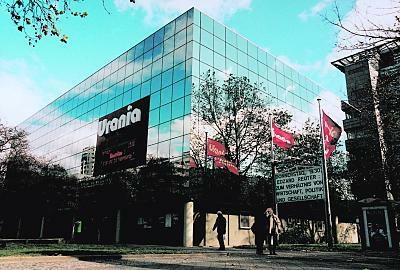 The fifth exhibition took place in the Hotel Maritim in Stuttgart from April 4 – July 31, 2004 and was enhanced by a series of lectures. 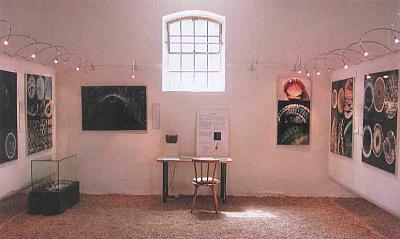 The fourth exhibition took place in the Johannis-church in Stuttgart-Möringen February 1 – March 28, 2004 in connection with several events and a concert. 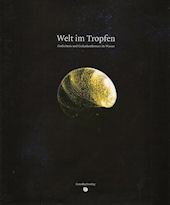 The third exhibition concerning the subject „World in a Drop“ took place from November 24, 2003 – January 22,2004 at the Urania Berlin. 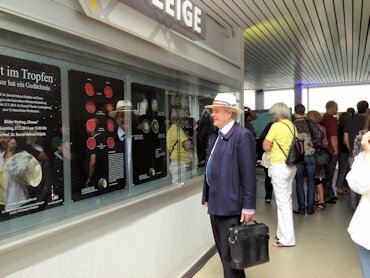 The second place of exhibition was an area of a wide service counter hall in the train station Stuttgart in summer 2001. The objects had been displayed on 15 meter long white strips of woven cloth. A superb attended lecture recruited the exhibition, which was enabled by sponsors and the Environmental Protection Agency Stuttgart. The very first exhibition „World in a Drop“ took place as an external project at the Expo 2000 in Hanover. Meanwhile the exponats have been multiplied.